With the Bank of Canada's interest rate decision hanging in the balance, Canada released its trade data for December. In the event, the Bank of Canada has left its key rate unchanged at 1.75%. The trade data echo a theme that has been in play for recent data; it is that some slowing is in train. In December, Canada's exports fell by 3.8% while imports were better maintained at a 1.6% rise. That combination, of course, widened the monthly nominal deficit to -C$4.6 billion in December from –C$2.0 billion in November. 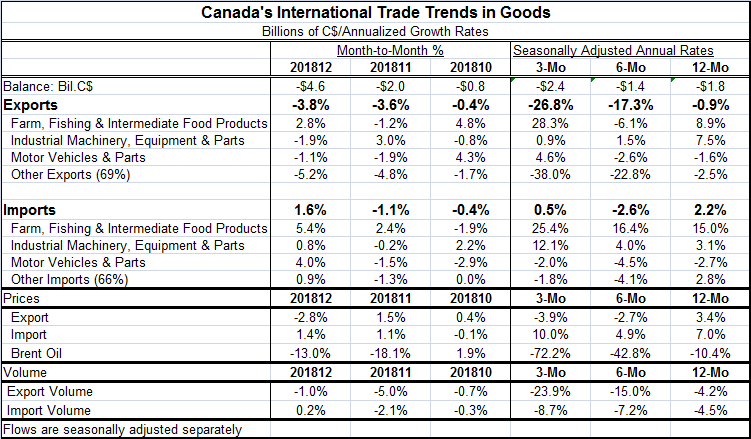 More broadly, over three months, Canadian exports are falling at a 26.8% annualized pace compared to imports that log a nearly static 0.5% rate of growth on the same timeline. Over 12 months, Canadian exports are falling by 0.9% with imports gaining a modest 2.2%. Re-expressed in 'real terms' by deflating the export and import flows by their respective prices, Canadian exports are falling by 4.2% over 12 months with import volumes dropping by 4.5%. Expressed in volume terms, both exports and imports are falling over six months as well as over three months. Both flows show accelerating deterioration with exports dropping at the faster pace and deteriorating at a much more rapid pace. Exports and import flows, of course, are the determinants of a country's trade balance. But beyond that, the two flows also reflect competitiveness conditions and growth conditions in their respective target markets. For imports that means Canadian domestic conditions and for exports that means weighted average growth in Canada's export markets. Canada's export and import trends accord with what we know about slowing in the European and U.S. economies as well as with the recent Canadian domestic reports on retail sales and GDP that have been disappointing. Separately, today the OECD issued a statement about how global growth was slowing citing vulnerabilities in China weakening growth in Europe and slower growth in international trade. Canada, like the U.S., Europe and Japan, continues to be a member of club for which inflation is undershooting its domestic objectives. Although in its report today, the Bank of Canada did regard inflation as broadly consistent with its target rather than emphasizing its 'technical' undershooting. Against such a background with slowing domestic growth weakening export and import trade values and a modest inflation outcome, the decision to hold rates steady is not much of a surprise. In its statement, the Bank of Canada called the global slowdown more of a surprise compared to its own January outlook. The bank cites oil price uncertainty and trade uncertainty right alongside a statement about U.S.-China trade talk progress. The commentary from the Bank of Canada makes it sound much more like the bank is now on the defensive, having reduced its outlook for growth while watching developments in household spending as well as in the international arena. However, the bank continues to refer to the slowdown in late 2018 and early 2019 as 'temporary,' an analogous posture the Fed's policy in the U.S. that has put its rate hikes on hold as it is being 'patient.' While some in markets assume that the Fed is done hiking rates, the Fed's own statement does not encourage that view; neither does the Bank of Canada statement. The BOC policy statement makes it clear that everyone is in the same boat internationally. With slightly changed language about what is 'domestic' and what is 'foreign' the Bank's statement this month could have been issued by almost any G-10 economy. However, Canada also has a brewing domestic political situation in which several members of Justin Trudeau's cabinet have resigned. There are concerns that need to be addressed about the potential politicization of Canada's justice system, charges Trudeau rejects, but that continue to haunt his administration. More broadly, these are challenging times for countries of the Western Hemisphere. Not only is Trudeau having to defend his administration, but in the U.S., President Donald Trump is under increasing broad and intrusive pressure as the U.S. awaits the release of the Mueller report and a growing offensive by Democrats. Mexico has a new leader but continues to battle crimes and the U.S.-Mexico border appears to have become very porous recently, not just in the world of Donald Trump, but according to reports in the New York Times, rarely a paper that tries to support Mr. Trump's policies. Venezuela is seriously troubled and the U.S. continues to field migrants in great numbers from Guatemala. The deterioration of conditions in Venezuela that have brought more Russians to the Western Hemisphere also has led to border issues between Venezuela and its neighbors. The EU is hardly the only area with a migrant problem. Global weakness is usually quickly reflected in trade flows and we do see that in the Canadian trade report. And during times of global weakness, trade tensions and moves to protectionism are usually on the rise. In this case, those movements got a jumpstart on the evolving weakness as the U.S. activism to re-equilibrate global trading relations has been in full swing. While U.S. diplomacy failed to make gains in North Korea, there are much higher hopes for the U.S. trade talks with China. As global growth weakens these talks loom larger in their economic significance. Today U.S. President Trump suffered yet another political 'defeat' as the U.S. trade deficit for 2018 finalized at a ten-year high. However, in fairness scoring that is a bit like scoring a basketball game in the third quarter or leaving a baseball game after the seventh inning. While the U.S. December trade report is a setback for trade deficit progress in the U.S., no one thought that the road to better results was not going to be bumpy or without its setbacks. The future and the ultimate success or failure of Trump's trade gambit lies ahead and every country that trades internationally has skin in this game.